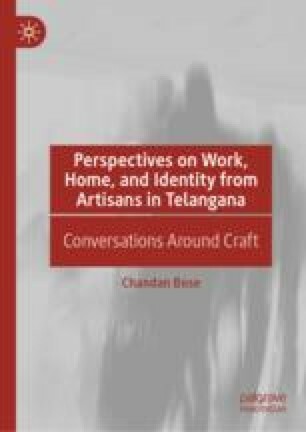 This chapter will introduce to the readers the different individuals, practices, spaces, objects and conversations that make up this study, which is about constructing different contexts within which multiple experiences of a craft practice can be located. The chapter shall be reflective of the author’s methodology, and critical of the contexts that frame the relationship between the author and the subject of study, viz. the category of ‘craft’ and ‘craftsperson’. Outlining the different locations within which this study aims to construct the different experiences of the craft practice, this chapter will highlight as its objective an integral premise on which the discipline of anthropology is based, namely a privileged place for alterity. Ramanan, Sumana. 2014. Meet the Cultural Icons of Telangana, India’s Newest State. Scroll, June 2. Accessed from https://scroll.in/article/657002/meet-the-cultural-icons-of-telangana-indias-newest-state.